I am really excited to share this project with you today. I’m a little in love with it, if I do say so myself. But before I get there, I thought I would share a little about my, let’s say, creative process. I currently have the joy of breastfeeding my 3 month old. In fact, she is a chubby 15 pounds and has yet to have one drop of formula. So, needless to say, I spend a lot of my day rocking and feeding. Often times I am in the middle of a project when, well, duty calls. It is during these times when I have to step away from my projects to nurse that I often rethink my projects. My projects evolve slowly, but this is one of those projects that I think really benefitted from this nursing/thinking time. This is what I originally set out to do…but then I thought, will I really use another necklace? I am either wearing one of two necklaces, or no necklace at all. Why would I make myself some more jewelry? So, I still wanted to make these washers. What could I do with them?!? 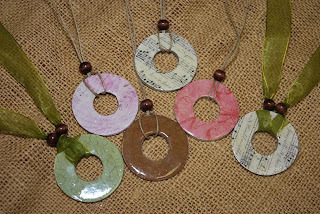 There are so many great tutorials on how to make the washer necklaces, so I will skip that part. Click the link above for that tutorial. 1. Make the washers as if you were making pendants for a necklace. 2. Lay out your design on your canvases. Mark where the main stem will be. If you are using several canvases then make sure that the stem will line up. Also mark where the washers are. 3. Mod Podge on green ribbon, a branch reaching to where each washer will be. 4. Cut out and add green leaves. Cut from various pieces of scrap green fabric. 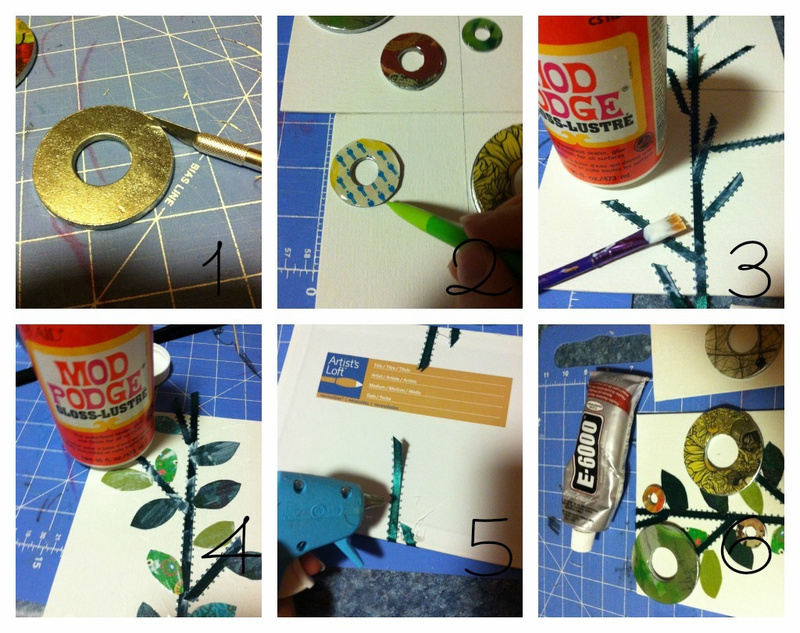 Mod Podge these on as well. Then give the entire canvas a coat of Mod Podge. 5. Hot glue the ends of the ribbon down on the back. 6. Pull out the E-6000 and glue on the washers. 7. Add an element to the back of each canvas so that it can be hung. A beautiful idea and blog! Saw this on someone’s board on Pinterest. This is an amazing project and one in which I will try. Thank you for sharing your tutorial with me. I love this!! I did a tutorial on the washer necklaces before, but never thought of taking it to this level! So sweet!!! 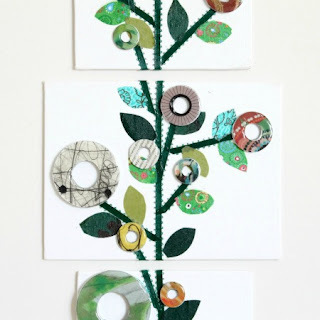 Thank you for sharing your project with us at A Crafty Soiree, I’ve featured yours in this weeks! I hope you’ll stop by to see it and share more of your crafty goodness with us. What a cute idea! I Love it!!! Thanks so much for sharing at Thursday’s Temptation. I am going to be featuring your lovely flowers at tonights link party! This is beautiful! And I have definitely pinned something exactly like yours.. maybe even the same one lol. I love that you made the washers flowers and hung it up. Great job. I love this idea! Thanks for sharing at Fluster’s Creative Muster. I’m looking forward to seeing what you link up next week. Hi Lovely, I’m your newest follower from Weekend Wonders #28 Blog Hop. What a fun art project! Pinning it! What a fun idea! I love the different patterns! I love it! The continuous design is so inspiring. Pinning! Love your idea. I have created necklaces using Stampin’ Up!s designer paper and could use the same paper for this idea too! Super cute! 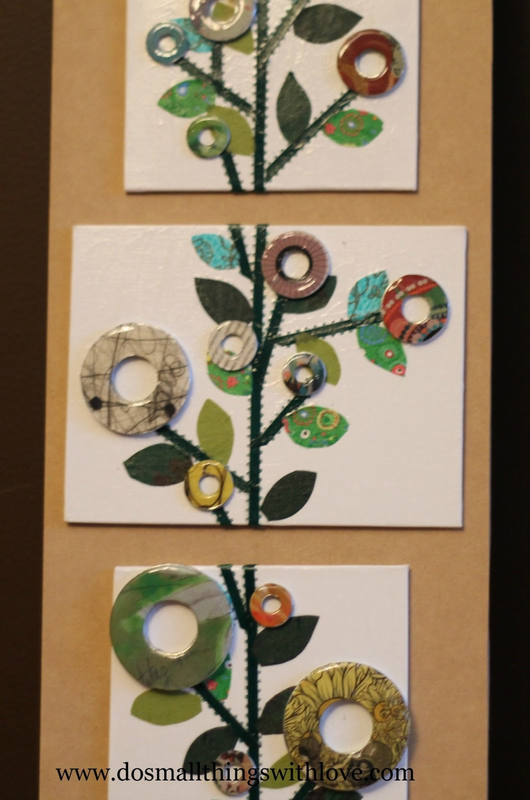 I love upcycling washers too! Love making jewelry with them even though I don’t wear a lot of jewelry. Does that make me a hypocrite? Stopping by from Fluster Blusters Linky! And following! Awesome idea! I have a blank canvas that I’ve been trying to decide what to do with… here’s another idea to throw into the mix 🙂 I’d be thrilled if you’d link up at this week’s Off the Hook! This is gorgeous (as always!) Did you use diamond glaze on the washers like the tutorial suggested? They are very shimmery and 3 dimensional! Super cute idea! I’ve don’t some washer art myself. Love yours. Have a great day! Great and original project! Love it!Thanks for sharing tutorial. This is just amazing! Very cool. Love this idea! Looks wonderful!